Columnist also names the " biggest harm [Trudeau] has caused so far." 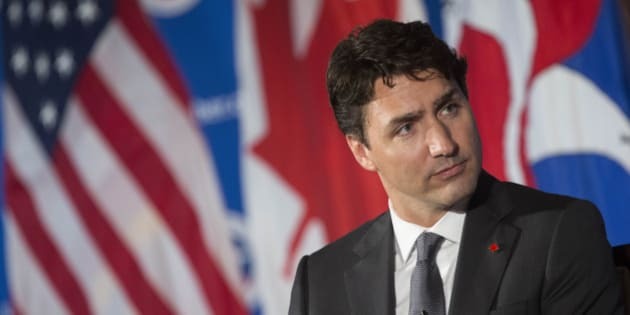 Prime Minister Justin Trudeau is limp on terrorism and too hard nosed that the world knows how good looking he is, according to biting column published in a Brazilian magazine this week. Veja, a prominent weekly, has long been a vocal critic of liberal politics, having most recently waged a campaign to take down the country’s left-leaning president amid a massive corruption scandal. For her Trudeau column titled “Justin Trudeau is adorable, but exceedingly ordinary,” the magazine’s international affairs columnist Vilma Gryzinski takes aim at the Canadian leader’s “dazedly well-intentioned” policies, suggesting his inclusive attitude on immigration and refugees means he's soft on terror. She also took a swipe the “narcissistic” leader’s recent celebrity over the attention he received for a five-year-old photo of him leaning into a table in a peacock pose — and made light of his genetics. “Justin Trudeau is the incarnation of the dreams of the vaguely left-wing liberalism, which is dazedly well-intentioned; a handsome guy who shows off his physics with no shame and in yoga poses — an Oedipean reproduction of his father, Pierre Trudeau,” writes the columnist in Portuguese. Margaret Trudeau made her bipolar disorder diagnosis public ten years ago. Since then, she’s been openly talking about her condition and living with depression, using her high-profile to be a mental-health advocate. Decades earlier, Trudeau’s mother made headlines dating rock stars and dancing at new York City’s legendary Studio 54. Her drug and alcohol use and decision to leave her young sons made her an easy target in tabloids in the ‘70s and ‘80s. But the country’s economy isn’t strong enough to keep Canadian talent home. Canada is “well organized” but “boring,” she says. She names Justin Bieber, Pamela Anderson, Ryan Gosling, Avril Lavigne and “supreme diva” Celine Dion as examples of people who’ve had to flock to the U.S. to reach a higher tier of success they couldn’t achieve at home. Of Canada’s media, Gryzinski isn’t impressed. And she’s not fawning over Trudeau’s inner circle, too. It’s not the first time Trudeau has faced international criticism. Last December, the prime minister's quip that Baltic nations are “not a thing” placed him in the hot seat from a handful of European politicians. “This is a message for Justin Trudeau that Baltic countries exist,” said Estonian politician Antanas Guoga said in a video response appearing alongside other Baltic region members of the European Parliament.